The investor group that owns the bulk of Juhl is gearing up to turn rentals into sales. KRE Capital, Dune Real Estate Partners and Northcap plan to start selling units at the downtown Las Vegas residential complex in late April, management announced Thursday. The group owns 306 of Juhl’s 341 units, having acquired them as part of a bulk condo purchase at five Las Vegas properties, including downtown high-rise The Ogden. Units at Juhl range from 600 to almost 2,000 square feet, and prices start in the high $100,000 range, the announcement said. Condos account for a small share of the valley’s overall home sales, and within that, high-rise units make up a fraction of all deals. Still, Juhl’s owners have launched sales efforts at other buildings and found buyers. In a phone interview Thursday, KRE Capital partner Uri Vaknin said his group’s units at Juhl have usually been around 95 percent leased. The investors will list them for sale as rental contracts expire but will renew some as they go, as they “don’t want to empty out the building,” he said. A sharp drop in the number of residents at Juhl could hurt the property’s ground-floor commercial tenants, and flooding the market with condos would almost surely drive down prices on themselves, given the valley’s relatively small market for such homes. “We’re realistic about the velocity in the marketplace,” he said. Buyers last year picked up about 40,200 homes in Southern Nevada, and 82 percent, or 32,830, were single-family homes. 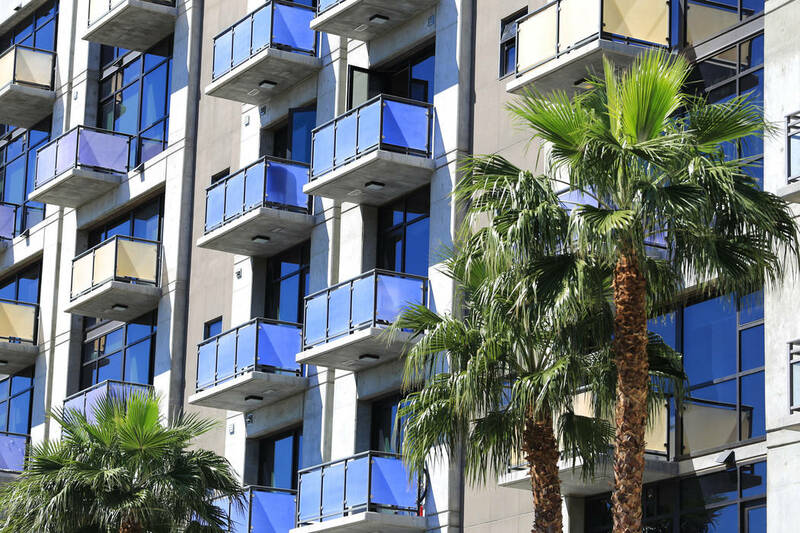 Condos and townhomes accounted for 7,368 sales, and among that tally, 820 were high-rise units, comprising 2 percent of all sales, according to the Greater Las Vegas Association of Realtors, which pulls data from its resale-heavy listing service. Meanwhile, builders closed almost 8,000 new-home sales in Clark County last year, with 96 percent of that total consisting of single-family houses, according to Home Builders Research. Juhl, at 353 E. Bonneville Ave. between Third and Fourth streets, consists of multiple connected buildings, with a 15-story tower rising above the rest. Ground-floor commercial tenants include bar and lounge Classic Jewel, Vietnamese restaurant Le Pho and health-food eatery Greens & Proteins. Beverly Hills, California-based KRE, New York-based Dune and Las Vegas-based Northcap bought almost 1,300 units in Juhl, The Ogden, One Las Vegas, Loft 5 and Spanish Palms in 2013 for $237 million combined. The seller was ST Residential, a group that formed after the economy crashed to acquire a stake in failed lender Corus Bank’s loan portfolio as part of a joint venture with the Federal Deposit Insurance Corp., a banking regulator. The KRE consortium bought around 250 of The Ogden’s 275 units and have 116 left to sell, Vaknin said. They acquired 188 of Spanish Palms’ 372 condos and have just nine remaining, and they bought 295 of One Las Vegas’ 359 units, with 225 left to sell. The group unloaded all 241 of its units at Loft 5, a 272-unit complex, for $51.5 million in November in a bulk sale to Weili Dai and Sehat Sutardja, the husband-and-wife ousted founders of Silicon Valley semiconductor company Marvell Technology Group.